Princess Cruises has set dinner times and pre-assigned seating, which means you are forced to sit at a table every night with 4 or 6 complete strangers. 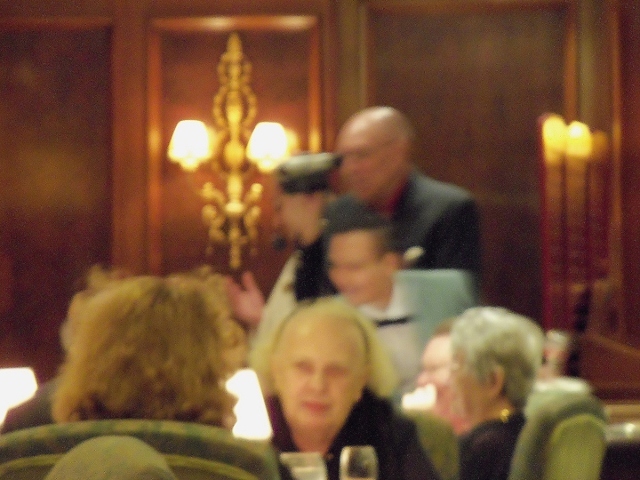 These people will be your dinner companions for the entire length of the cruise. As you can imagine on a cruise of 7 days this can lead to some long, dull if not downright unpleasant dinners. On a cruise of 2 months it could lead to multiple murders or suicides. Consequently we have requested a table for two, something which can be hard to come by as the cruise lines are under the mistaken impression that we would rather dine with a group of boring people than be on our own. And indeed when we check our table assignment we discover we have not been given a table for 2. I decide I need a quiet meeting with the Maitre D who goes by the name of Jean Paul. He has a heavy accent and a lapel badge claiming he is from Italy. He is tall and balding with a pair of heavy black framed glasses sitting on top of a nose that is well equipped for the job of supporting them. I am not the first passenger who wants to discuss seating arrangements with him. I join a long line of unhappy diners. He sees us one at a time behind a partition which is designed to give some privacy to the disgruntled passengers. However as voices frequently get raised in anger I have no trouble listening in. Jean Paul shows no sign of gruntling any of them. He politely brushes them all off, saying that the ship is full and compromises have to be made. My turn comes and I decide to approach him with charm rather than anger. And for those of you in the back row saying I don’t possess charm, please be quiet. I explain my position, while quietly pushing a $50 bill across the table to him, saying that we are going to be on board for 58 days and are hoping that he will be able to look after us. He looks down at the bill with feigned shock and says that he couldn’t possibly take my money and hopes that I might like to offer something at the end of the cruise. I suggest that now is a better time to offer him a tip as we might miss each other at the end of the trip. He tuts his disapproval while making the $50 bill disappear faster than a whore’s drawers. He then walks me round the restaurant showing me different tables and asking me to choose which one I would like. We are seated next to a table of 6. There are two English spinsters of indeterminate age, one in need of a shave, or at the very least a pair of tweezers, and both in need of a beauty shop. The hairy one sits at an angle of 45 degrees, her arms draped along the chair arms making her look like a large overstuffed reclining chair. She has made no attempt to look smart for dinner and in fact appears to have resorted to upholstery fabric to cover her body. Her friend has made slightly more of an effort and has her mousey coloured hair wrapped up in a bun and a pair of glasses sitting on her chest. For some reason she has the glasses attached to a cord around her neck, although her glasses are unlikely to fall from the ample shelf they are sitting on. She has a pair of cheap white gym shoes on her feet, but there seems to be very little likelihood of her every entering a place of fitness. To their right is a couple from Australia and much as I would like to belittle them too, they benefit tremendously from the comparison with their neighbours. They are slim, smartly dressed, and sitting upright in their chairs. 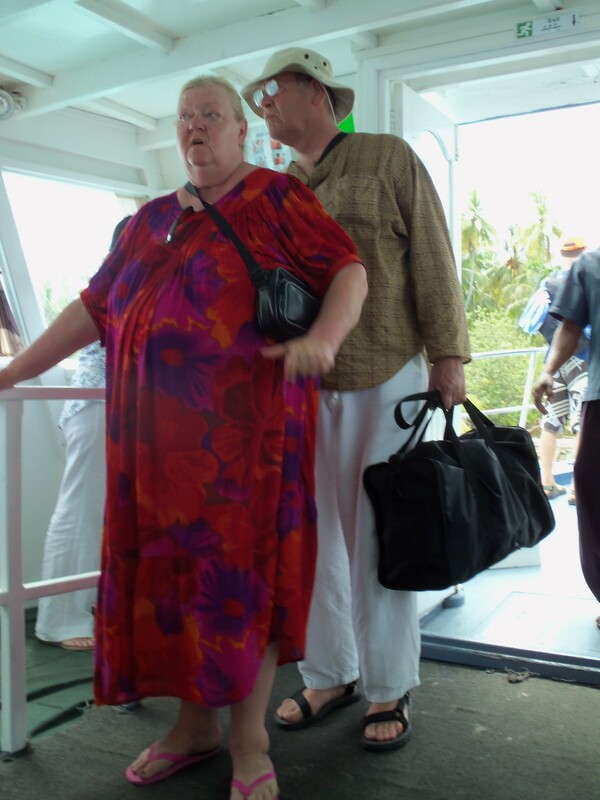 The last couple to arrive is a giant pair of African Americans. She is an imposing woman, a little under 6 foot tall and a little over 200 lbs. Unlike the English women, she has clearly spent hours in the beauty shop and has been immaculately prepared for the evening. Everything about her suggests money, class and intelligence. She is clearly someone to be reckoned with. Her husband is no less impressive. He must be 6 ft 6 and is beautifully turned out in a well fitting black suit. His bald head shines as if he had it polished in the same beauty shop his wife was in. He is carrying an enormous video camera. His wife takes a seat introducing herself to her table mates. The husband stays standing and points the camera at the table, making a slow arc from one diner to the next asking them to introduce themselves into the camera. This is exactly why we have a table for two. The Australian husband , clearly agitated with the conversation, interrupts by saying that that can’t be true as Romney is about to be the next Republican Presidential candidate. Score one for the Australians. She completely ignores him and continues to wax lyrical about President Obama. Bravo for the chair, and score one for England. Great recovery! Score one for the Americans. That last point seems to settle the match as the other couples retire injured. For the rest of the evening the black lady talks and no listens. We enjoy our table for two. Actually two passengers. It doesn’t matter where we go, they are always there fighting to be at the front of any line. Once there, their inability to move at anything but a slow waddle, holding on to railings, chairs, or anything else that might support them, brings the rest of the line to a standstill. Within days they are hated by all. I laughed out loud reading this. Wonderful desciption of the English woman as “the overstuffed chair”. You have a great way of capturing characters with a few well chosen words. Thanks Chloe. I’m glad you’re enjoying it. too funny! who needs Downton Abbey?? I see the Herman tact has not quit mid-ocean! Enjoy your table for two and we will enjoy your eavesdropping!! Spoilsports! How could you deprive the plebs of your witty repartee and a chance to learn from such sophisticates! Not much better than the company! I can hardly wait for the next installment!!! You had me at “multiple murders”!